There’s a lot to love about South Kuta, from the hive of activity in the shops, cafes and restaurants, to the stunning sunsets on the beach. Located walking distance to Segara Beach, close to Waterbom Park, as well as street side shopping and dining, Aryaduta Bali takes advantage of all of that South Kuta has to offer and more. Enjoy the resort’s roof top swimming pool, workouts in the fitness centre and onsite restaurant, Henry’s Grill and Bar. Stay in an elegant Deluxe or Deluxe Premier Room with balcony, depending on your option chosen. The Deluxe Rooms are stylish and contemporary interior with an oversize bathroom. The rooms also include a sofa, satellite television and have views over the region. The Deluxe Premier Rooms have a stylish, contemporary interior and include an oversize bathroom. 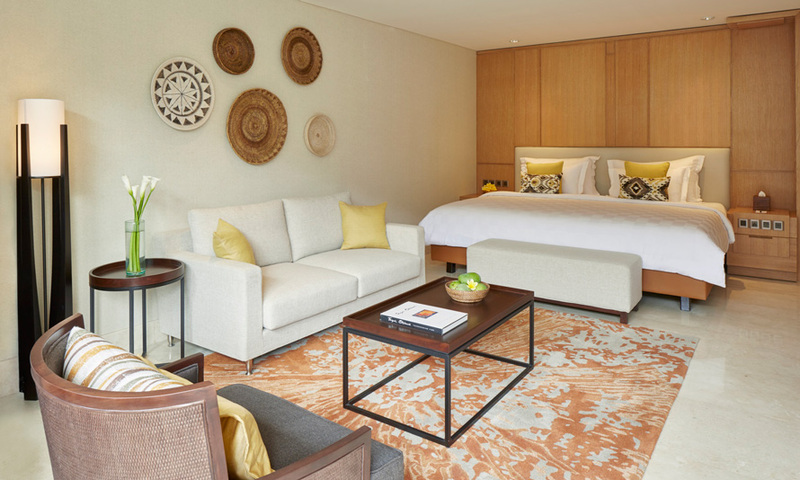 The rooms also include a sofa, satellite television and feature a private balcony directly overlooking or leading into the hotel’s central gardens. 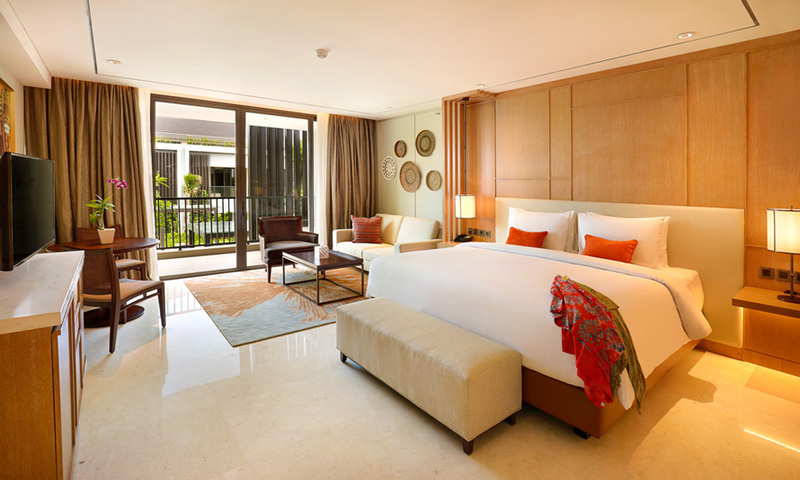 Aryaduta Bali is a superbly positioned hotel destination. Located close to Bali’s most recognised attractions that include an array of cultural and leisure pursuits, Kuta Beach and upmarket shopping in a mall that shares the same grounds as the hotel. Aryaduta Bali is located in South Kuta, minutes from Waterbom Park, colourful street side shopping and within close walking distance to the popular Segara Beach. The hotel is just ten minutes from Bali airport and ten minutes from connecting roads to the coastal and highland communities of Seminyak, Nusa Dua, Jimbaran Bay and Ubud. After purchase, you will receive a receipt and a Purchase Confirmation. You will also be directed to an online Passenger Information Form (PIF). You must submit the Passenger Information Form within 14 days of purchase. The Property will then confirm the booking directly with you via email. Please do NOT book any required flights until you have received booking confirmation direct from the Property. Please note: If airport transfers are included, please ensure that once your booking and flights are confirmed, that you send a copy of your flight details to the Property to determine when and where you will be picked up from. Please note: We recommend submitting your PIF as soon as possible to secure preferred dates. All bookings are subject to availability. Submit the Passenger Information Form within 14 days of purchase and if you don't get your preferred dates, we will give you a full refund. *3 preferred booking dates at least 5 days apart must be requested. *All requested booking dates must fall within the validity period of the deal. *Evidence of an attempted booking must be provided to TripADeal via email no more than 3 days after the 14 day period. We will aim to secure your preferred dates and if they are still unavailable, a full refund will be payable. Travel offer is valid for travel until the 31st March 2019. This travel offer is priced for 2 adults and 2 children. For solo travellers no discounts apply. Please note: upgrades to other room types can be booked directly with the hotel and are subject to availability until confirmation with the property. Please note: extra nights are based on room only and subject to availability until confirmation with the property. Airport transfers are not included if you wish to arrive early or stay behind. A maximum of 2 vouchers can be combined. Please note: extra nights are subject to availability until confirmation with the property. Extensions on any inclusions offered as part of the deal, are strictly subject to the resort/hotels discretion. Please see ‘other important information’. - Infants 0 – 5 stay free of charge at the property, sharing existing bedding with parents and do not count towards room capacity. - Children are classed as 6 – 12 years old. - Children will receive all inclusions stated in the deal offer (excluding alcoholic drink). - Children 13 years and over are classed as adults. Please note: any additional adult sharing a room will receive all inclusions stated in the deal offer. Please note: some room configurations may require the use of existing bedding (subject to availability). King or Twin bedding (subject to availability). - Visa fees and requirements (A visa is granted upon arrival if travelling on an Australian passport). - Domestic transfers / flights in Australia. - Domestic flights in Bali. - Meals/beverages not stated in deal offer. Please note: 7th March 2019 is Nyepi, a public holiday in Indonesia. This is a day of silence, fasting and meditation for the Balinese. If you are in Bali from 6am restrictions will apply for 24 hours. Mandatory religious prohibitions to beaches, streets and activities will apply to everyone. Check in and check out will not be available throughout the day. All shops are closed on Nyepi Day. Guests are to stay inside the villa area. Sound must be kept at minimum level if listening to music or watching TV. There will be no traffic during the day all throughout Bali as the airport will also be closed there will be no arrivals or departures. Daily drink at the roof top bar can be chosen from beer, radler, soft drink or coconut juice. - Voucher must be presented at check-in. Bali enjoys a tropical, warm and humid climate all year round with two main distinctive seasons: Dry Season and Rainy Season. A tourist visa is not required for stays in Bali for stays up to 30 days; provided the arrival and departure in Indonesia is from Ngurah Rai - BALI or other airports or seaports located in Indonesia* please refer to www.visasdirect.com.au for further information. Visa Exemption is NOT permitted for holders of Temporary or Emergency passports.